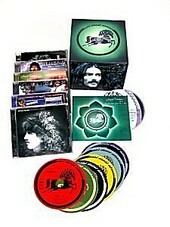 A box set from the late ex-Beatle, George Harrison's The Dark Horse Years 1976-1992 chronicles Harrison's post-Apple Records (The Beatles' label) career, when he left Apple and started his own imprint, Dark Horse. Featuring Thirty Three & 1/3, the self-titled record, Somewhere In England, Gone Troppo, Cloud Nine, and the Live In Japan record (released in SACD). The box set also includes The Dark Horse Years 1976-1992 DVD, originally released exclusively through this box set, but now available as a stand-alone. Filled with snippets of Harrison as he explains his songs and videos before launching into them, footage from the Live In Japan tour, and clips from the movie Shanghai Surprise. The DVD might be the greatest feature in the box set, though the re-mastered re-releases of the Dark Horse albums are worth their weight as well. While All Things Must Pass is arguably Harrison's greatest work and biggest selling record, and one that might be the first thing that comes to mind when you think of Harrison. The releases on his own Dark Horse imprint stand out as his true musical legacy, the records that hint at his stubborn, challenging, and oft-confusing musical path. Strayed far away from The Beatles (more so than any other member of the Fab Four), it is on these releases that Harrison's music truly breathes, free of any expectations or guidelines. Live In Japan is a two-disc set from a 1991 tour that found Eric Clapton playing guitar in Harrison's band and these live recordings catch that magic as it unfolds, Clapton's guitar genius matched by Harrison's, a virtuoso of the slide guitar. Highly fun, energetic, and lively, Harrison has never sounded more vital on record, caught in his element as both Clapton and Harrison feed off each other. Other gems include the Jeff Lynne collaboration of Cloud Nine, Harrison re-living past glories with songs he originally wrote for The Beatles, and Harrison paying homage to Lennon, the first Beatle to pass away. A fine commemorative, The Dark Horse Years are through and through Harrison's own. This box set helps celebrate that individuality with pride and honor, giving the royal treatment to the Dark Horse legacy and thus the legacy of Harrison's unforgettable contribution to rock 'n' roll - and our lives. I'll give it an A.